Thousands of Israelis spent the night in bomb shelters as terrorist in the Gaza Strip fired some 40 rockets and mortars at communities near the coastal enclave early Wednesday, with several of them being intercepted by Iron Dome. There were no reports of injuries. The IDF said that rockets and mortars were fired at the Eshkol, Sha’ar Hanegev and Sdot Negev regions and that Iron Dome intercepted several of them, while the rest fell in open areas. The army did not give the number of launches, but Hebrew media reports said there were more than 40. Sirens also went off in other regions including the city of Ashkelon and the town of Netivot, but the IDF said they appeared to be false alarms and they were investigating the cause. Earlier in the evening fragments of a rocket that had apparently been intercepted by the Iron Dome landed in a sports facility in the southern town of Netivot. The shards of the projectile caused light damage to a number of structures, but no injuries. One woman, who was close by at the time, was said to have suffered a panic attack. A video, shared by Channel 10 news on social media, showed a cloud of smoke coming out of the area following the impact. Despite the attacks, schools in the region were set to open on schedule Wednesday morning. Late Tuesday Israeli warplanes hit some 25 Hamas targets in the Gaza Strip in a second wave of retaliatory strikes, the army said, as Palestinian terror groups continued to fire mortars and rockets into Israel. Midnight came and went with no signs of a reported ceasefire deal to end a day of cross-border attacks that began with a barrage of mortar shells from Gaza into southern Israel. Terror groups in the Gaza Strip said the agreement had been reached under Egyptian mediation, while Israeli officials denied a truce had been agreed upon. The military said fighter jets, helicopters and other aircraft bombed a Hamas drone facility, rocket manufacturing plant, advanced weapons depot, military compounds, training camps and weapons factories. Video from Gaza showed large explosions rocking the area as aircraft were heard roaring overhead. This was the second round of strikes carried out by the IDF in response to mortar and rocket fire from Gaza. On Tuesday, Israeli aircraft targeted approximately 40 positions in the Gaza Strip belonging to the Hamas and Palestinian Islamic Jihad terror groups. Earlier, Hamas and the Iran-backed Islamic Jihad released a joint statement claiming responsibility for the dozens of rockets and mortar shells fired at southern Israel throughout the day. Israel holds Hamas responsible for all violence emanating from the coastal enclave, that it has ruled since 2007. “Hamas chooses to act against the interests of the residents of the Strip and, after it failed with its violent riots along the security fence, has decided to launch and to allow the launch of numerous projectiles at Israeli citizens,” the army said in a statement. 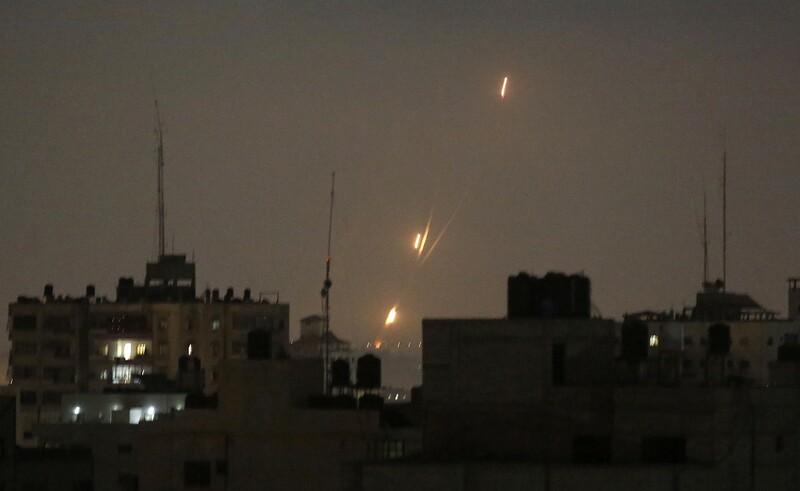 IDF Spokesperson Ronen Manelis said at an evening press conference that the army was prepared to intensify its retaliatory raids if Hamas and Islamic Jihad continued to launch projectiles at Israel — which they did. “The IDF is prepared for a number of scenarios, is determined to act against terrorist operatives and will continue to fulfill its mission of defending the citizens of Israel,” the army said. The conflicting reports on a ceasefire came as Gazans continued shooting barrages of projectiles at southern Israel, capping a day that saw over 70 rockets and mortars fired at communities near the Gaza border. He told AFP that Gaza’s rulers Hamas were also committed to it. The Shehab news outlet, which is affiliated with the Hamas terrorist group, reported that Egypt helped broker the agreement, which was supposed to come into force at midnight, and which was based on the truce reached at the end of the 2014 Gaza war. But a senior Israeli official denied that a deal had been reached. “The reports of a ceasefire are not correct,” the official told reporters, speaking on condition of anonymity. Earlier Israeli news reports said Egypt was attempting to mediate an end to the military escalation in the Gaza Strip and had urged Palestinian terror groups to halt their attacks on Israel. Hadashot TV news reported that Egyptian intelligence had contacted Hamas and Islamic Jihad and urged them to rein in projectile fire in order to prevent the violence from spiraling into a larger conflict. Egypt had been instrumental in calming tensions in the Strip earlier this month, after clashes during violent protests along the border led to the deaths of 62 Palestinians, at least 53 of them members of terror organizations. Tuesday saw at least 70 rockets and mortar shells launched into Israel from Gaza, as well as dozens of retaliatory strikes by the IDF against terror targets in the Strip, after weeks of soaring tensions in the region stemming from weekly protests on the border. In an early morning mortar shell barrage, one shell exploded in the yard of a kindergarten shortly before children arrived. Israeli officials and Hamas and Islamic Jihad both sent out signals Tuesday evening that they were uninterested in a further escalation of violence, even as sporadic rocket fire trickled out of the Strip after sundown. “We are not set on escalating the situation, but the Israel Defense Forces will respond forcefully to all fire from the Strip and will exact a price,” a senior Israeli official said, after a top-level emergency meeting convened by Prime Minister Benjamin Netanyahu. Intelligence Minister Yisrael Katz told Army Radio the cross-border violence could potentially intensify. He said Israel was closer to war than it had been since 2014, when the country fought a punishing 50 day war with Gaza-led fighters that the enclave has yet to recover from. “We don’t want war and neither do they, but we have our red lines,” Katz said. Meanwhile the US requested an urgent meeting of the UN Security Council to discuss Palestinian attacks on Israel, the US mission said. The council was scheduled to meet Wednesday to discuss the cross-border violence. The international community was largely supportive of Israel throughout Tuesday, condemning terror group’s salvos of rockets and mortars on civilian populations, while calling on both sides to work towards calm. This entry was posted on May 30, 2018 at 6:24 AM and is filed under Uncategorized. You can subscribe via RSS 2.0 feed to this post's comments. You can skip to the end and leave a response. Pinging is currently not allowed.